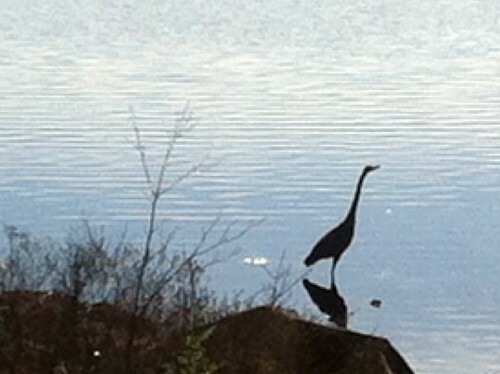 Blue heron, originally uploaded by leyaevelyn. A few days ago I heard someone on the radio talk about a how there is some movement in California towards recognizing the necessity of the arts. Because I didn’t hear the whole program, I don’t remember exactly who was talking and when I tried to look it up, I was frustrated. But the gist is, teaching the arts in schools is important because they, the arts, teach creative thinking. A creative mind is inventive. Creative thinking makes dollars and sense. Then today I heard on the radio about a study listing the ten worst degrees to achieve in terms of getting job. Of course, the arts was number one, the worst. Listed also was my other degree, English Literature, somewhere around number four. There are lots of interesting studies and surveys out there. My favorite is the one that says 76% of people roll their toilet paper from the top. I happen to be in the 24% minority. In fact, countless times, I find someone has turned the roll the other way in my own house. I must have had it on backwards. It’s just a habit. Not very creative. Of course, money isn’t the driving force behind being an artist. It feels more like a choiceness choice. It feels so right. It’s not that I couldn’t do anything else. But this is it for me. And the money, well, as always, we will see. Hello Leya, I saw this article the other day. I’m not sure it’s what you were looking for but thought I’d pass it on. Thanks, Brian. It’s not the same story but a good one. Glad to see it!